On your Surface, the Music app’s Explore area lets you browse through the music bins for music to add to your own collection. Much like shopping for music on Amazon or iTunes, the Explore section lets you hear 30-second snippets of music to make sure you’re buying the right songs. Open the Music app from the Start screen and tap Explore from the app’s left column. The Music app’s Explore section opens. The opening screen lets you browse selections devoted to new albums, top songs, and top albums. Tap one of the selections to browse its wares. Tap the New Albums category, for example, and the store lets you sort the new albums by category — Jazz, for example — as well as subcategories within that genre. Spot an album or song you need? Jump to Step 4. If you’re still looking for a song, move to the next step. Search for a particular song or artist. The Search box atop the left column searches whatever category you’ve chosen, be it your own Collection, Radio, or Explore. Because you’re in the Explore category, type an artist’s name or song into the Search box and press Enter to see the matches. When you’re looking at an item you want to purchase, tap the Buy button. If you want to buy an entire album, click the Buy Album link to download MP3 files of every song on the album. Want just one song from the album? Then select that song by sliding your finger horizontally across the song’s name. The app highlights the song, and the App bar along the bottom sprouts a Buy Song button. Pay for the item with the credit card associated with your Microsoft account. If you don’t have a credit card linked with your Microsoft account, the program walks you through the process. After you complete the purchase, the app downloads the music into your collection. 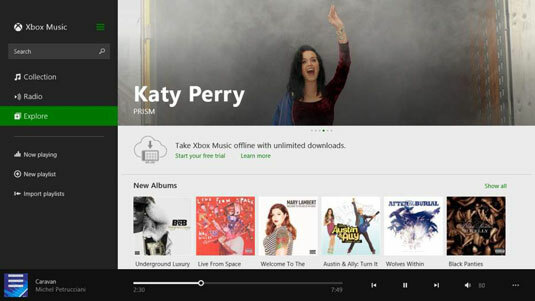 Purchased music and albums stay in your collection even if you stop your Xbox Live Pass subscription.